Less than a month since Gerald’s Game, and less than two since It (and three since The Dark Tower, but we don’t have to acknowledge that one), yet another Stephen King film adaptation has arrived, coming straight to Netflix just as Gerald’s Game did, and leaving just as strong an impact, if not a complete slam-dunk as that film was. 1922, directed by Zak Hilditch and adapted from King’s short story of the same name, mostly takes place in that titular year, when lowly farmer Wilfred James (Thomas Jane) lives a simple existence on his farm in Nebraska, along with his wife Arlette (Molly Parker) and their son Henry (Dylan Schmid). However, Arlette is keen on selling their land and moving to Omaha, but Wilfred is reluctant to allow her to do so, as he’s grown far too comfortable in his ways. As he fails to persuade her otherwise, and when she threatens to divorce him and take full custody of their son if he doesn’t comply, he begins to have more murderous thoughts, and even gets Henry to help him out when he realises that moving away will also mean being separated from his next-door sweetheart Shannon (Kaitlyn Bernard). However, once both father and son commit the crime and all too easily manage to convince everyone that she ran off, their guilt overshadows them and causes them to make life-changing decisions that put both of them in far worse situations. The core strength of 1922 is how it handles its themes of pride and guilt, and what happens when both of them collide in the most grisly of manners. Director Zak Hilditch quite elegantly creates a chilling atmosphere around this farm, from the eerie shots of cornfields accompanied by a tingling score, to the increasingly rundown nature of the interiors which soon start to rot like the corpse they unceremoniously bury in their well. Most of all, though, Hilditch relies strictly on this unpleasant mood and environment to get its biggest frights, none of which are accompanied by loud musical stingers or any of the other obnoxious horror movie tropes; you feel frightened just from the situation, and how much this man and his son are falling afoul of their own better sense of characters because of their confounding guilt over what they have done. It is a human horror, one that makes an attempt to dissect and study the irrational thinking behind Wilfred’s murderous scheme, which he claims via narration to have come from a “man” inside us all who gets these thoughts from time to time, and shows us the deep psychological impact it is having on those around him, specifically his son who over time moves further and further away from his grasp. 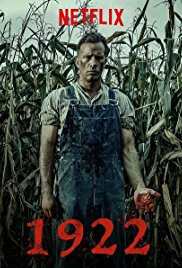 In a performance that somehow blends authenticity with caricature and yet works, Thomas Jane scowls and mumbles his way through the film with an alarming swagger, commanding the screen with every one of his strong Southern-dialect monologues, creating a very different kind of monster to the likes of Pennywise or Christine or any other one of King’s famous creatures. Beneath this character’s simple exterior is a calculating and manipulative creep who would rather do away with his wife than give up a profession and place he holds dear to his heart, and the actor does a stunning job at showing his pathetic side but also a part of him that’s far more dangerous, to himself more than others. It’s a fascinating character study of someone watching their whole life fall apart all because of their initial stubbornness, and it’s anchored by a haunting lead performance by Jane. Where it falls a little flat though, at least in comparison with something like Gerald’s Game, is its ability to truly shock you. There are certainly some gruesome moments, but there’s nothing quite as effective as anything you will have seen in Mike Flanagan’s film, and definitely not as memorably insane. This is a much slower burn, taking more time to focus on its characters rather than actual scares, which is fine but if you’re going in wanting to watch a truly scary psychological horror then you may end up not exactly getting what you were hoping. It’s very different to Gerald’s Game, and probably not as effective, but it still manages to work as a disturbing character study that you may or may not want to revisit but will leave you with plenty of chilling psychosis to pick at for days to come. Either way, it’s better than The Dark Tower. 1922 is a chillingly made psychological horror as well as a stunningly acted character study that’s a worthy addition to the ever-growing line-up of decent Stephen King adaptations.